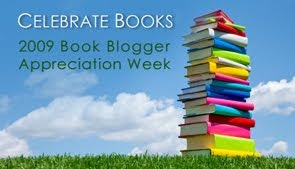 Serendipity Reviews: Book Bloggers Appreciation Week. Well Book Blogger Appreciation Week has arrived and I am feeling a little overwhelmed with it all. I am at a lost at whether I should join in or not. I feel like a new kid in secondary school, a uniform that is too big and has precise creases in the legs, a bag full of essentials that I will never use and a map of the school but no idea which classroom I need to go into next. I have spent all day, reading some fabulous blog posts about the blogs that are the best to visit and I am feeling the love right now. I want to thank everyone who wrote about my little blog and made me feel all warm and cosy inside. I am still giggling over Alyce's comment over At Home With Alyce, who wondered if I sounded like Julie Andrews. Those who have heard me talk, don't shatter her illusion of me! Well, I cannot resist this blog loving appreciation, so here is a list of book blogs I just can't live without. At Home With Alyce - I just love to visit Alyce blog. Alyce is a fantastic book blogger, whose writes superb reviews which only adds books to my TBR list. Alyce linvites you in and makes you feel at home. I love to know what happens in Alyce's world..
Bibliophile by the Sea. - Diane is a thoughtful blogger, who always shows her caring side when she comments. Diane reads voraciously and I love the style of books she reads. Book, Line and Sinker - Natalie writes posts that make me think. I come away from her blog full of new ideas for posts. Natalie's posts are witty and entertaining, always keeping me amused. Books Love Jessica Marie and Carries YA Bookshelf - These two lovely bloggers are often responsible for the majority of my Friday Finds. They have a nose for finding the yet to be published,especially in the YA genre. Fluttering Butterflies - Michelle was one of the first book bloggers I met online and I feel like we have become good friends since I started blogging. Michelle has a talent for blogging about reality and her posts actually make me think about my life. Michelle reads a lot of the same books as me, so I love to see what new ones she has found. Hello, My Name is Alice - Alice is not just a book blogger, she is one fantastic photographer. Alice creates a mixture of reviews and photography on her blog. One of the first people to welcome me to the book blogging world. Katrina Reads - I met Katrina through Sunday Salon and found some fantastic books on her blog. The books she chooses are often new to me and often end up on my ever growing TBR list. I got my own back though, by converting her to scrapping. Melissa's Bookshelf - I just want to delve into Melissa's book cases as she has all the books I want to read. Melissa is always first to read the latest and often has me spending my pennies. Things that Mean A Lot - Nymeth, what can I say! If you haven't been to Nymeth's blog, then you must visit. Nymeth is definitely one of the most influental book bloggers I have met. I would say she may be responsible for a very high percentage of the books I actually buy and read. Nothing of Importance - I just love Debi and her family. Her posts are like conversations over a cup of coffee and a slice of carrot cake. Debi doesn't consider herself a book blogger, but she definitely is and her choice of books really influence my TBR list. Page After Page - I feel like Kim is an old friend who not only provides me with book reviews, but also some fabulous recipes. I always feel at home on her blog and want to sit down on a cosy sofa and talk books and food. Passionate Booklover is a new blog to me, but one I really enjoy visiting. Andreea and I share a similar taste of books and I feel like we should just swap our books back and forth as we end up reading the same books. Peeking Between The Books - Dar, we love you and miss you. Come back soon. Christina -Reading Thru The Night. Christina makes me laugh and is definitely a bad influence on my book pile. Socrates Book Reviews - Yvonne has an entertaining blog, full on brilliant reviews and some really funny cat photos. The Bookworm - Naida, one of the first book bloggers I met, who was quick to make me feel welcome. Naida really enjoys historical romance and is also very good at crocheting. Her blog is eloquent and a joy to behold. The Book Resort - Diane is amazing. She writes the most posts and seems to get everywhere. I think secretly she has secret powers. Her blog is constantly evolving. At present, she is drip feeding me New Moon trailers. The Zen Leaf - I only recently found Amanda's blog and now it is part of daily routine. Amanda is a superb writer and her posts really make me think. I hope to see her name on the bestseller list one day soon. The Eclectic Reader and The Queen of Happy Endings - Teddyree and Alaine - these two lovely Australian ladies are wonderful book bloggers and as well as keen scrappers. They are best friends and I am glad I found their blogs. I am going to have to stop there, but I feel bad as there are so many other wonderful blogs out there that you need to visit. A Striped Armchair and so many more. Thank you all for letting me into the book blogging world and making me feel at home. I thank you all for giving me permanent neck ache from the hours spent over the PC. My family thanks you for their clothes never being ironed or washed, their dinner only arriving via the microwave and the house constantly looking like a scene from Stig of the Dump. I love you all.! Oh my...I have too many book blogs to go check out! :D I'll be back later ot look at these more. I'm kind of running around scattered today, piece by piece. Ahhh nice to see Jess metioned! She was my dorm neighbor last year in college and I love seeing her success. I know - I could have gone on and on with my list, but I just had to stop somewhere. You've given me a couple new blogs to check out. I see a lot of blogs there that I like and a few that are new to me - I'll have to check them out. You listed such great blogs! Thanks for giving some my favorites air time -- it was impossible to list everyone. I'm sorry I help you spend so much money, lol! Thanks for including me on your list :-) Cheers! This is a wonderful list of books and I can't wait to check out the ones I'm not familiar with. I'm so glad you decided to participate in BBAW, Viv! Oh thank you so much, Vivienne! I love your blog too! Thanks for including me on your list. It looks fabulous. You're always giving me more to read! Thank you so much, Viv! I'm so glad to know you and you're a super scrapgirl! I'm going to check out the other book blogs you've mentioned here. Thanks again! I was so happy to see me on your list; i'm glad you enjoy my blog. You already know I think yours is pretty darn great! Thank you SO much, Vivienne :D I'm so happy to be included among so many bloggers that I love. Thanks for a great list! I know some of these "gals", such as Amanda and Naida and Diane, but others are new to me. I will be sure to visit their blogs. I've been reading Alice, Naida, Dar, and Nymeth for quite awhile now. Kind of new to The Book Resort though. Great post, great bloggers too! I now look forward to your photo 'tours' as much as the reviews and scrapping posts. Oh, thank you for saying such lovely things about my blog..
Awwww...thank you for including my blog here and saying such nice things :) You made my day! lol about the Julie Andrews comment, now I wonder if you sound like her too! Terrific list, Vivienne! You have included many of my favorites. The ones I don't know I am going to check out tomorrow! I have starred your post in my Reader so I will be sure to!